There is no comprehensive study of prostitution in Montana, but history clearly reveals a handful of colorful women who found financial security, owned property, and successfully navigated between social classes by less than reputable means. With an uneven ratio of women to men, many considered prostitution a necessary and unavoidable evil. With the discovery of the tremendous gold reserves in the mid-1860s, Last Chance Gulch and the town site of Helena assumed a distinctive colorful character. The prosperity of Helena’s mines was mirrored by its extensive red light district. By the 1880s a few increasingly powerful madams consolidated ownership and erected several large parlors and bawdy houses. 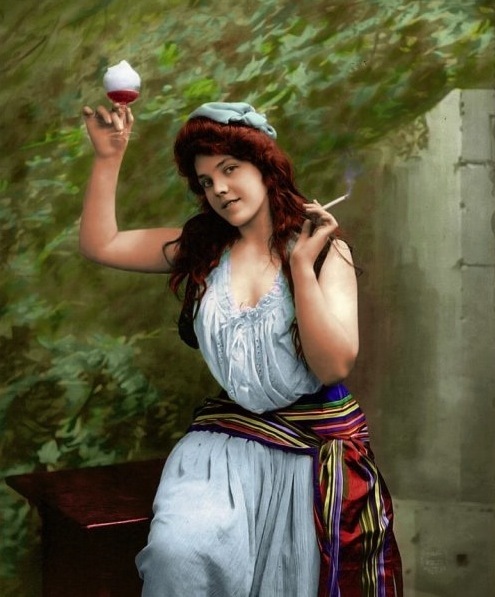 By 1886, 52 white prostitutes worked in Helena’s demimonde, which for more than 20 years had constituted the town’s largest single source of women’s employment outside the home. One of the most famous of these women in Helena was Josephine Airey, better known as “Chicago Joe.” In 1858, Mary Welch left her home in Ireland behind to find a better life in America. The first thing she did was change her name to Josephine Airey. She worked in New York and Chicago and by age 23, she boarded a train headed west for the rich mining town of Helena. Josephine brought three things with her: her savings from Chicago, her experience, and the charm of the Irish. When she arrived in Helena, she invested in a piece of property on Wood Street. Her first business venture was a crude, one story, hurdy-gurdy house. It became so profitable that in three years Josephine needed to expand. Because Josephine lacked the necessary capital, she was forced to borrow from one of Helena’s notorious lenders, Alex Lavenburg. His conditions were hard to meet but she agreed to them. She mortgaged everything including her underwear and 3-dozen pair of underclothes. She paid Lavenberg six months before the note was due. The fire of 1874 swept through Helena and the majority of the buildings burned to the ground. Most land owners could did not have the money to rebuild and Josephine was able to purchase their property for cheap. At the age of 30 she was the largest landowner on Wood Street. Of all the Montana towns touched by prostitution, Butte was arguably the most infamous. The vast majority of the prostitutes were not parlor girls, but rather every day working man’s whores who lived and worked in the cribs lining the streets and alleys of Butte’s tenderloin. Nicknamed “The Perch of the Devil,” Butte has a notorious history of drinking and prostitution. The Anaconda Copper Mining Company held pretty much everything under its thumb, including mines, newspapers, parks, utilities, and any type of entertainment. Nothing links the “entertainment” such as drinking, gambling, and prostitution directly to the Company, but any form of vice that required time and money ultimately benefited the owners. A thriving red-light district meant that thousands of single miners would spend their time and pay checks on entertainment rather than organizing against their bosses. In the early 1900s, businessmen and reformers such as Carrie Nation protested the open prostitution and drinking. Businessmen wanted the immoral district shut down or at least moved away from their shops. Petitions were sent to the mayor but the city was making a lot of money from the fines, so many were hesitant about taking action. It was not until the Prohibition Era that everything was shut down or forced underground. As a result of the reformers, petitioners, and eventually laws, the red light district compacted into the alleys after 1903, and later became a network of hidden cribs. Like Butte’s male population that worked underground in the mines, many of its red light women followed suit, moving to underground cellar cribs. Today, evidence of this underground system is apparent at the Dumas in several places. The Dumas is Butte’s only surviving 1890s parlor house. Inside the Dumas, at the end of the basement hallway is a door bulging with sand on its opposite side. The city only recently filled the passageway behind the doors when an accident caused part of the tunnel to collapse. Such tunnels were part of the city’s early steam heating system and once ran the entire downtown area. The tunnels provided easy access to cellar cribs like those at the Dumas. Journals tell of how a man could enter from a business block and return unseen. Similar tunnel systems ran from bars and hotels to underground cribs in Havre, Montana and can still be toured today. The district’s basements and tunnels protected it from reformers ongoing efforts to shut down the bars and prostitution completely. By the end of 1917, prostitutes who previously solicited openly in houses, rooms, hotels, and dance halls, only worked behind closed doors. Even though Montana’s “Red Light Madams” have disappeared, their colorful stories cannot be forgotten.